Costi is a family man whose cash-strapped neighbor makes him an intriguing proposition: help him find the fortune reportedly buried somewhere on the grounds of his family's country home and split the profits. Romanian with English subtitles, currently on Netflix. Here and elsewhere, if the humor were any drier, it would be dust. [...] The result is a tension that’s almost below the threshold of feeling, which may or may not make up for its general paucity of action. [Writer/Director Corneliu Porumboiu's] best movies embody a kind of stylistic paradox: they are slow-paced, but also narratively concise; they contain long, slow scenes in which nothing in particular “happens” but they also feel entirely fat-free. Porumboiu’s new picture "The Treasure" is entirely in keeping with that mode but also expands on it, with disarmingly delightful results. It's like watching about a hundred Guy de Maupassant short stories get thwarted, and what is left after winnowing feels more real and subtle. I don't recommend clicking on the quotes above and reading a summary of the movie. 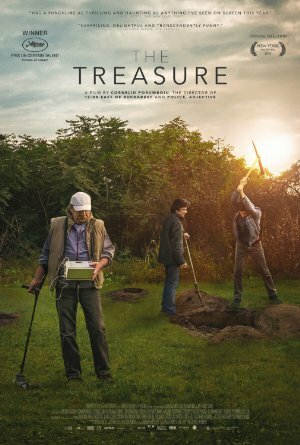 Just watch if if you're intrigued by the combination of phrases like, "if the humor were any drier, it would be dust," and "slow scenes in which nothing in particular 'happens' but they also feel entirely fat-free," applied to a movie about searching for buried treasure, the maguffiniest maguffin of them all. Watching this reminded me of my Romanian coworker's cynical-yet-acquiescent-yet-pushbackful conversational style, and apropos of nothing I'll always remember he introduced himself to me with a joke: "Do you like my watch? ... It's Russian—fastest watch in the world."